The Bermuda Economic Development Corporation [BEDC] today [Aug 27] announced that enrolment has opened for its ‘Entrepreneurship 101’ course, providing new and aspiring entrepreneurs with knowledge, tools and resources to start their business off successfully. The eight-week programme will run from Monday, September 10th to Monday, October 29th, with participants expected to walk away understanding the basics of small business management and how to create an effective business plan. 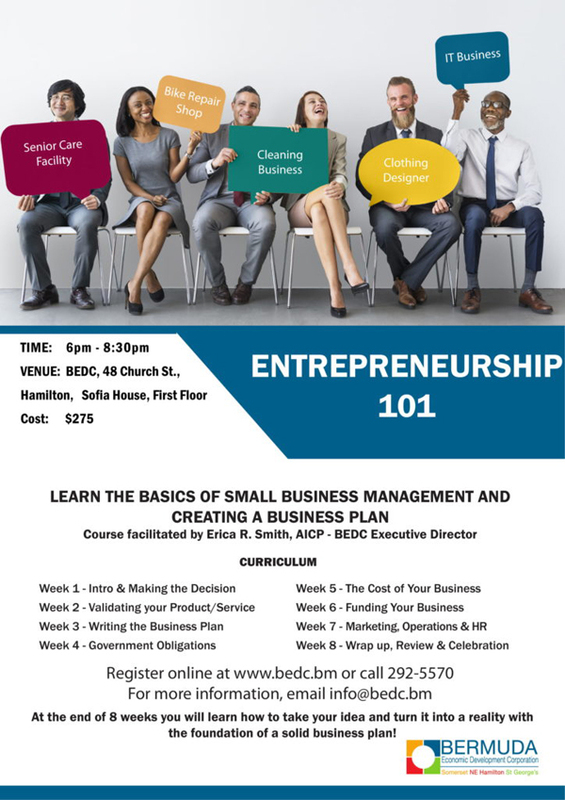 Facilitated by BEDC’s Executive Director Erica Smith, the course teaches participants what Government regulations are necessary to start a business in Bermuda, how to budget, manage finances, maintain healthy cash flow, market the business, recruit great staff, and get/keep customers. Stated Mrs. Smith: “When putting together the syllabus for this course, we kept in mind some of the major challenges faced by entrepreneurs on the Island. I’ve been an entrepreneur myself in the past and continue to meet with business owners on a regular basis, so I’m aware of how difficult it can be to set up and operate a business in Bermuda. Past student Marjorie [Miki] Caines, owner of ‘Best of Bermuda’ award-winning brand, Lifestyles Co Limited, said taking the Entrepreneurship 101 Course last year has enhanced her business knowledge and allowed her to learn from the good and bad experiences of other entrepreneurs. As well as learning about common business pitfalls, Ms Caines said the course taught her how to cater more to her target market and handle business financials. She encouraged aspiring entrepreneurs to invest in their learning and development in order to grow their businesses over time. Similarly, Vivien Carter took the course this past Spring after working on her business idea for over a year. She said: “I took the course to give me a better understanding of what I needed to do/ have in order to qualify for bank loans, investors and to get support with understanding how business financials work. Most importantly, I wanted help with figuring out if I even had a viable business idea to begin with. “I’ve always known it would be a lot of work to open my own business, however, this course really helped me to see what I could do for myself and what parts of the plan I would need help with. My advice to anyone looking to take this course is regardless of whether you have a burning business idea, already have a start up or are an emerging small business owner, this course has something to offer you. Marketing, Operations, and Human Resources. To register for the upcoming course, which costs $275, email info@bedc.bm. The classes will take place from 6.30pm until 8.30pm at the BEDC Office, located in Sofia House at 48 Church Street, Hamilton.